Here is an activity that is perfect for that first week of school or for getting ready to go back to school! Our printable backpack activity helps younger kids – preschool, pre-K and Kindergarten practice important information such as writing their Name, Address and Phone Number. “Phone Number” goes on the phone face/screen. 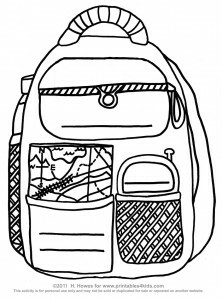 Kids can then decorate the backpack and draw items in the top pocket (pencils, keys, snacks). The back of the page can be used to list items that need to be packed on the first day of school. For an extra activity, make a photo ID and attach it to the backpack handle with ribbon or string. Click on the backpack to view and print full size. Feel free to share this activity with your child’s teacher or caregiver as a fun way to get all the class ready to go back to school!